The app lets those on Medicare search for products and services to see if they are covered. The Centers for Medicare and Medicaid Services have launched its first-ever patient-facing app. 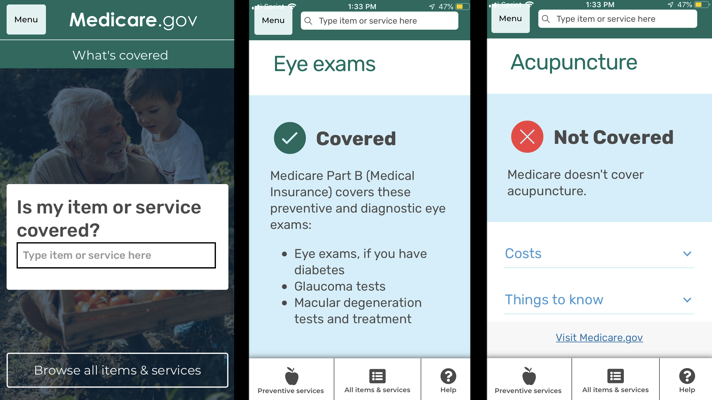 Called “What’s Covered”, the app will allow people covered by Original Medicare (that is, not Medicare Advantage) to search for particular medical products or procedures and see if they are covered. The app is easy to use, with no sign-in required. It's part of a broader initiative called eMedicare that also includes the agency’s Blue Button 2.0 data sharing initiative, which helps Medicare users access their claims data by providing APIs to third-party app makers. The app is available as of today in both the iOS and Google Play stores. According to CMS, there are forecasted to be 80 million Medicare beneficiaries by 2030, nearly twice as many as there were in 2015. Furthermore, CMS data shows that 65 percent of Medicare users are online, and the sorts of questions the new app answers are the most frequent inquiries they receive. This app should cut down on the three million-plus coverage-related phone calls CMS fields from individuals. Other aspects of eMedicare are web-based and launched last year. They include price transparency tools, tools to help users decide between Original Medicare and Medicare Advantage and more intuitive surveys to help CMS collect feedback on the user experience of these tools. This is definitely CMS’s first consumer-facing app, but there have been a few apps in the past that were designed for other healthcare stakeholders. In July of 2013, CMS launched its first two apps, iOS-only apps for physicians that aimed to help physicians and others track payments and other information they receive from the industry as part of the transparency program called the Sunshine provision in the Affordable Care Act. Those apps are no longer available as of now. App Annie also lists a now-defunct CMS National Training Program app that debuted in July of 2015. Outside of apps, CMS has taken major strides lately to support reimbursement for telehealth and remote patient monitoring.